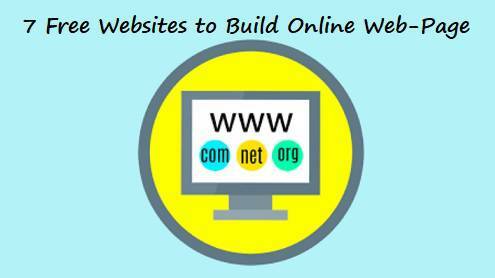 In this article, I have listed 7 Free Websites to Build Online Web-Page. Using this online tools you can design, create the web page for your website. This website provides drag and drops functionality. You can drag and drop all HTML components. Here many of the websites are using WordPress to create web pages. And if you want to design and code web pages on your own then the following sites will help you. They provide both the option like either start from the scratch or customize some pre-ready templates to create landing pages or any page for your website. No matter who you are – photographer, restaurant owner, musician, hotelier and more, you can manage your website and business all in one place. With Wix, the possibilities are really endless. This includes everything from simple products to even bookings and registration for events. Wix is also an excellent option for eCommerce stores. You can build just about any site imaginable with Wix. They offer more than 200 Apps and services to make it easier for you to grow your business or brand online. Easily send beautiful emails, start your own blog, get booked online, open your own online store and more. There are so many themes to choose from. They’re all well designed, too. You can create your website with Jimdo. With Jimdo your professional website is ready in just a few minutes. Every website is unique. Choose the one that’s right for you, and see how easy it is to get the website you’ve always wanted, without any programming. They provide the best speed performance. In uCraft you can choose a wide selection of fully customizable designer templates. You can choose a pre-ready template for your website and edit it as you want. After modifying a template, you can opt to host that on a subdomain of your choice. I liked one most thing in uCarft is that the templates which are available on it are very nice. They provide best template compare to any other site. And you are free to choose anyone to create the web pages. You can use the drag and drop method to add components like image, paragraph, container, tables, customizing typography, and some others. WordPress is an open-source technology, meaning anyone, anywhere can build stuff for it. WordPress is user-friendly as some of the other website builders on this list. There is no more popular content management system (CMS) than WordPress. WordPress.com provides everything you need to get online today. Create a basic site that’s free forever—no credit card required. When you’re ready, upgrade your site to one of our affordable plans to get more features like 24/7 live support, Custom domain name, Ways to directly monetize your site, Thousands of third‑party plugins and themes, and much more. Professional eCommerce tools for entrepreneurs, all in one place. Weebly is one of the bigger website builders with over 40 million users. My favorite Weebly feature was the intuitive editor. It was very easy to create and customize site options. Weebly includes hundreds of great templates organized by type, including drag-and-drop options for e-commerce, too. They offer a limited free plan! So you can try it out on a small scale before paying. If that’s not good enough, they also offer a 15-day free trial. Webs.com hosts over 55 million sites. Their simple drag and drop interface makes building beautiful free websites quick and simple. Webs also provided a good customer service experience. Live chat only takes a few seconds to get started, and the agent was very helpful. They provide A TON of design templates — around 2,500. Whether your website is for business or pleasure, their robust features will help you succeed online. doTemplate is quite an old site that offers a lot of free templates. However, this website allows you to use the templates for non-commercial use only. You can use doTemplate website without creating an account. Just look for a template which looks good for your website and then you can export that. It gives you a ZIP file containing the HTML, CSS, and JS code. It offers an editor in which you can edit the template and ultimately get the code. You can customize a lot of things like header, text, and other web page components. When you are done, you can simply download the template on your PC using the HTML download button.